1. Open our Axis 360 Digital Library at http://ellia.axis360.baker-taylor.com/#. Log in using your Library ID and pin code. Your Library ID is the 10 digit number on your ELLIA library card. Your pin code is your first name in lowercase letters. The first time you login, you will be asked to create an account with your name and e-mail address. 2. Find an e-book you would like to read and check it out. 3. 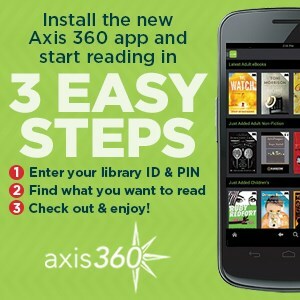 Download the Axis 360 app on your tablet, smartphone, eReader or computer. Download the e-book and enjoy! The library would like to thank the American Embassy in France for their financial support of this project.